Since the beginning, two issues plagued nearly every dock. First, when you lift up your phone the dock would come with it, requiring two hands or some awkward hand movements to pry it loose. Second, your phone disconnects from power when you lift it up. The first problem has been solved a variety of ways over the years. ElevationLab had previously created a frictionless 30-pin dock for the iPhones of the time that would allow you to easily dock/undock one-handed. The Lightning cable, which usurped the 30-pin, made a frictionless cable impossible. So manufacturers resorted to using sheer mass instead. Those like the ElevationDock 3 or the Grovemade dock were both largely crafted from metal. The weight made it easy to remove your phone without the dock being dislodged. To achieve a hefty enough weight, the size of these docks were rather large. ElevationLab bucked this trend of large docks with their previous ElevationDock 4. It traded in the sizable metal body for a much smaller plastic one with a special micro-suction foot. The micro-suction is a piece of foam that acts like thousands of tiny suction cups, creating a grip to whatever surface it is on. You can remove it at any time, and won't cause any damage to your furniture. We've seen this micro-suction material in the past and it is something we've grown quite fond of. Some case manufacturers have even adopted it for their iPhone X folios. As a solution to the second headache, ElevationLab created a unique detachable cable. It has a 90 end that is able to firmly clip into the CordDock. Clearly, this is where the name comes from. To detach the cable from the dock, you simply tilt your phone forward and lift. The cable will then come with the phone, allowing you to continue to charge. In use, this means if you lift your phone straight up, it detaches from the cord, if you tilt forward, the cable will detach from the dock and stay connected to your phone. We love that it has these two methods for un-docking your phone. When it comes to docks, one of the first things we check, is its compatibility with a wide variety of cases. The CordDock shines in this aspect. The back of the dock features two adjustable back plates that screw in/out to fit depending on the thickness of your case. Under the phone, are two magnetic pads that you can swap for thinner ones that allow the cable to fit a case with a thicker bottom. CordDock truly is more of a cord than a phone dock, and it is quite clever in its implementation. Of all the great aspects of CordDock, the only thing we were really able to ding it on was the choice to construct it from more plastic than metal. We love the solid, clean, anodized look of Apple's docks, and would have liked to see a more premium build of the CordDock using aluminum instead. Of course, the difficult construction could make that more difficult (and expensive) to achieve. The CordDock, as well as ElevationLab's other excellent docks can be found on their website, or on Amazon. The CordDock, with the MFi approved Lightning cable included, will run you $42. A bit less than the wildly popular ElevationDock 4 which runs $59.95. I don’t use a case, so I don’t have that problem. This looks really sweet. Guess it’s a plastic base? Metal would have been nice, but I know how expensive that would have been to manufacture. Read the Amazon US reviews before buying. Just have to add that there is a learning curve on how to dock it back with the cable attached but after a while it works every time. Now it would be perfect if the cable would wind itself up inside a (bigger) base stand but that would add bulk to it. My only (minor) quirks is that it doesn’t look clean by whipping the cable back to get it out of the way before docking. For my iPhone X, I use Apple's 29W USB‑C Power Adapter with a USB-C to lightning cable and it charges my phone very quickly. Maybe I missed it but did it mention anywhere in the article how many watts the ElevationLab CordDock provides? 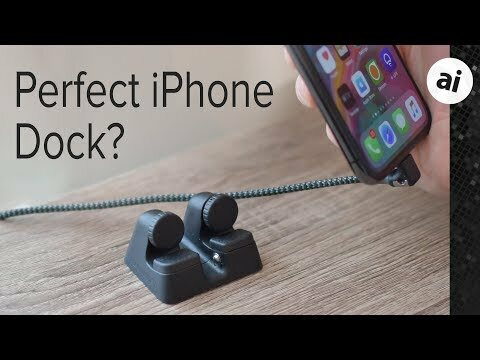 I am using a Just Mobile Alubolt Dock. It has a good Aluminum base & support in the back for iPad Mini support. I think that dock is more premium than this one. I'm sure it provides zero watts - it is a special charging cable, not a charger. So you could at most plug it into an iPad charger and charge at 12W. ai is there a way to have the cord come out the front not out the back or is it made so that it can only come out of the back? Can you give us a hint and save us a click? In general I'd prefer to trust an in-depth review by a trusted source than the Amazon crowd, but perhaps they are calling out some specific problem with this? Just go over and read the reviews. Particularly the three and four star reviews. It’s worth it. netmage mentioned both a 29W USB-C Power Adapter and a USB-C to lightening cable. This does not work with the 12W iPad charger. It does charge quicker than 12W on devices that support it. There was even an article that test charging speeds that documented it.